When I first heard about the innovative Eight Sleep pillow, I was very interested in trying it out, and I jumped at the opportunity to test it. This pillow is marketed as offering a fully customizable sleep experience, and I was curious to see if it would match up with my expectations. Buying a pillow doesn’t have to be complicated, once you determine what kind of sleeper you are and the type of support you need. Eight Sleep is an up-and-coming company within the sleep and mattress industry. It was founded in 2014 and is located in New York City. They are known for producing high-quality mattresses, pillows, and sleep accessories at reasonable prices, and for incorporating the latest in smart sleep technology into their designs. As one example of this, Eight Sleep mattresses work with an app that measures and provides reports on sleep duration and quality, as well as offering the option to warm up your bed before getting into it. These technological innovations are driving sleep technology into the 21st century, and Eight Sleep is on the very cutting edge of this. This brand has found special popularity with the Millennial generation, though the quality and comfort of its mattresses and pillows have garnered aficionados from all ages. The Eight Pillow is designed with a simple principle in mind: one size doesn’t fit all. People have different needs and preferences when it comes to sleep, which are shaped by their sleeping position among other factors. This pillow features a proprietary design that incorporates removable layers that can be rearranged in nine different ways to provide the amount of head and back support you require. The highly adjustable design allows you to personally configure and reconfigure the inner pillow components to suit your desired firmness or softness. The Eight Pillow has three layers that can be arranged in various orders to create a soft, pillow, a firm pillow or a thin or thicker pillow. It includes a 1” cushion, a 2” cushion, and a 1” layer of memory foam. 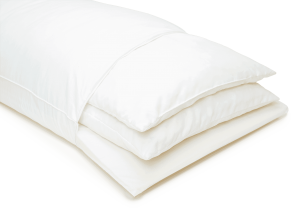 They are all encased in a simple, breathable cotton pillowcase. The memory foam layer is very dense and firm. It provides perfectly molded support to the head and upper spine. The cushion layers come in two layers of thickness. These layers of cushion are filled with shredded foam pieces and provide fluffy support that can be layered or used separately for ultimate comfort. Side sleepers and those chronic neck pain – sleep with the memory foam at the top for a firm pillow. Back sleepers – stack the cushions on top of the memory foam for a medium firm pillow. For a soft pillow remove memory foam and only use the cushions. The Eight Pillow can be customize by removing or changing the order of the three internal layers. The Nectar pillow is another customizable foam-based pillow that contains chunks of foam of different sizes and shapes. The Nectar pillow is more customizable than the Eight pillow, but you end up with memory foam all over the place when you dump it out, and it can be quite messy and disorganized to assemble and disassemble. 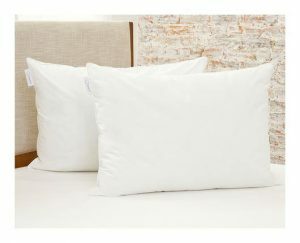 The Eight pillow in comparison is a good pillow and has relatively easy adjustability. This provides a simpler user experience. Both are priced at $75 which is a reasonable price for the quality and adaptability of the products. This pillow delivered on its scheduled delivery date, and I happened to have guests in town and staying in my home. This ended up working out great, as more heads meant I had multiple testers and opinions. First, I gave the pillow to my father-in-law to test. The first night he tried it, he said it he thought it was good. He slept on it in the same configuration as it arrived, with the memory foam on the bottom. He said he likes a firmer pillow when he sleeps with Philips Respironics sleep apnea device. A firmer pillow is more comfortable while wearing his CPAP machine. The second night, he tried the pillow a different way, by turning it over to the firmer side. This was much better, and almost as firm as he likes his pillows. Next, my wife tried sleeping on the Eight pillow for a few nights. She really liked it, because I removed two of the three pouches. This made it a very thin pillow, with memory foam only, so it was still comfortable. When I used the Eight Pillow, I configured it for a medium firmness. I used all of the cushions provided and did not remove any, and I stacked them on top of the memory foam, so the foam was on the bottom layer closest to the mattress. This configuration seemed to work exceptionally well for me. I found I could have a comfortable and relaxing sleep using this pillow. I did not wake up at any point during the night. I enjoyed being able to reconfigure the pillow to suit my sleep needs. I also thought the cotton covering of the pillow was soft, comfortable, and breathable next to my skin. If you are unsure of what pillow firmness or thickness you want, you can buy this pillow or the Nectar pillow. Both feature an innovative design and provide excellent adjustability for your sleeping position. Also, buy this pillow if you want to sleep on a very thin pillow. My wife uses this pillow because it is almost impossible to find a pillow thin enough for what she likes. Eight is a good guest pillow as well, in large part due to its ease of personalization. You can simply ask your guests if they like their pillow firm or soft, thick or thin, and in a matter of seconds adjust the pillow for them. I tried this with several of our house guests, and they were impressed with this feature. Overall, this pillow is helpful due to its customizability and is an excellent option for sleepers with very specific needs in a pillow that traditional pillow designs are unable to meet. You can purchase the Ultimate Eight Sleep Pillow here. Snorecoach Review – Does the Smart Device Work?